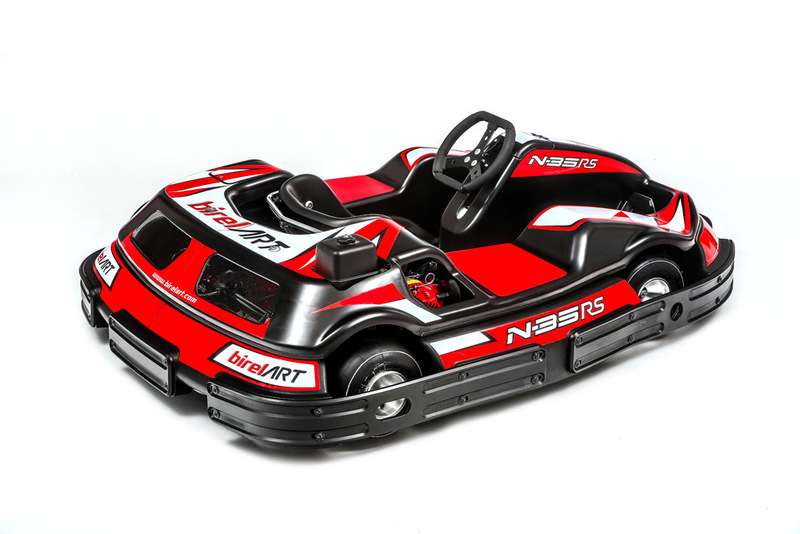 The N-35 XR RS model has been designed to place it at the top of the rental kart market. 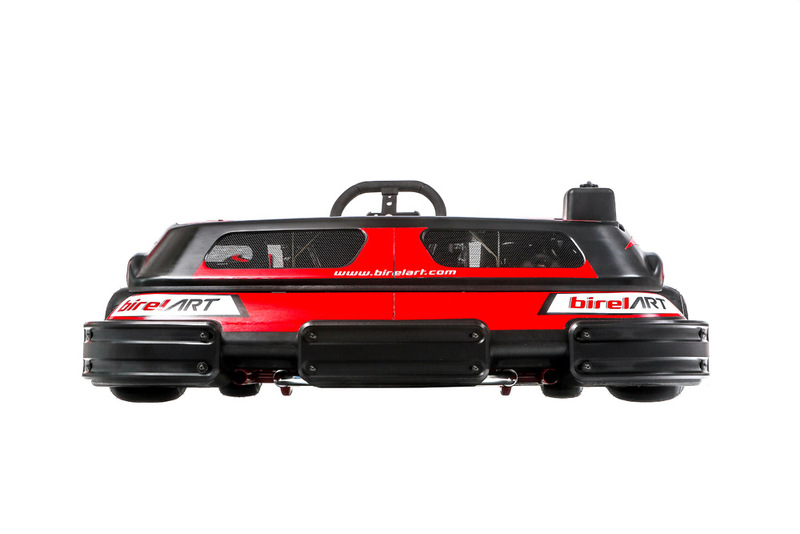 Its weight is 150kg, around 30 kilos lower than the competitors’. 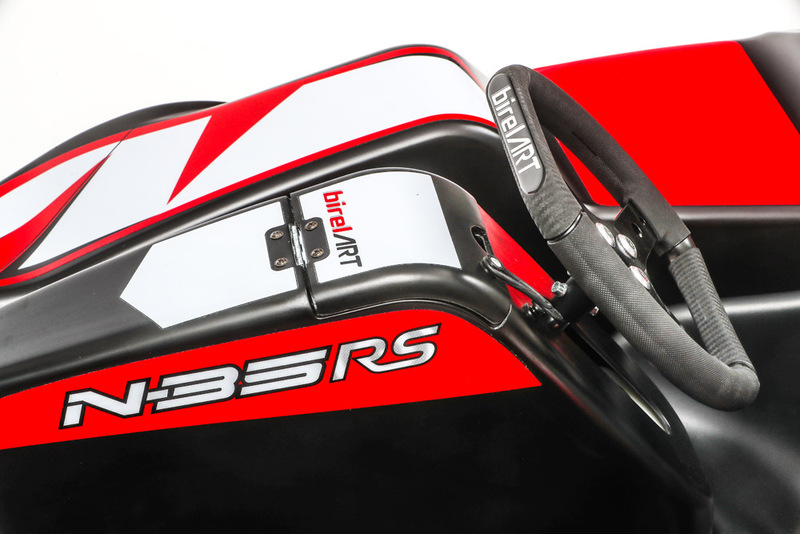 This feature allows for a reduction in fuel consumption and increase tyre life. 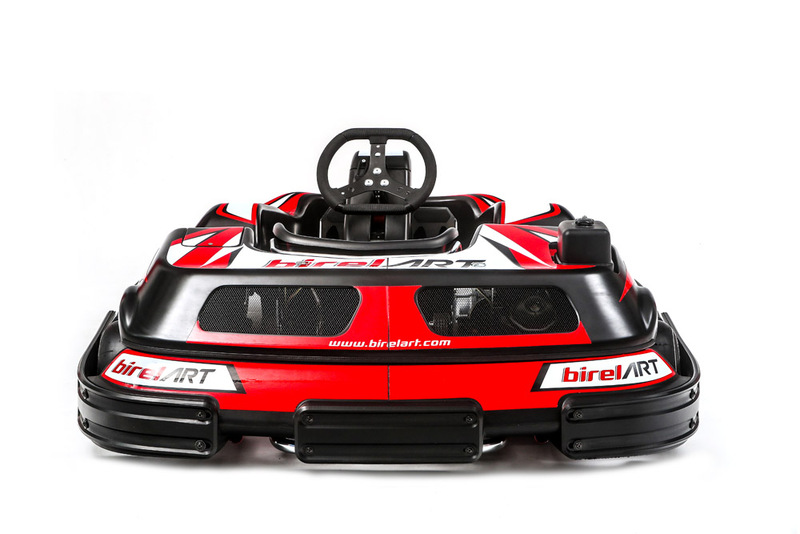 It also reduces the maintenance and running costs as well as ensuring greater reliability. 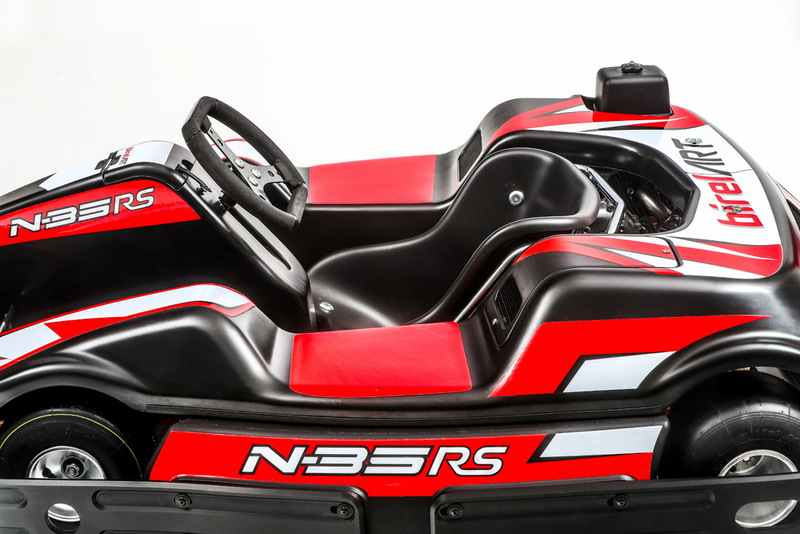 N35-RS features an adjustable and anatomical positioning of the seat and pedals. 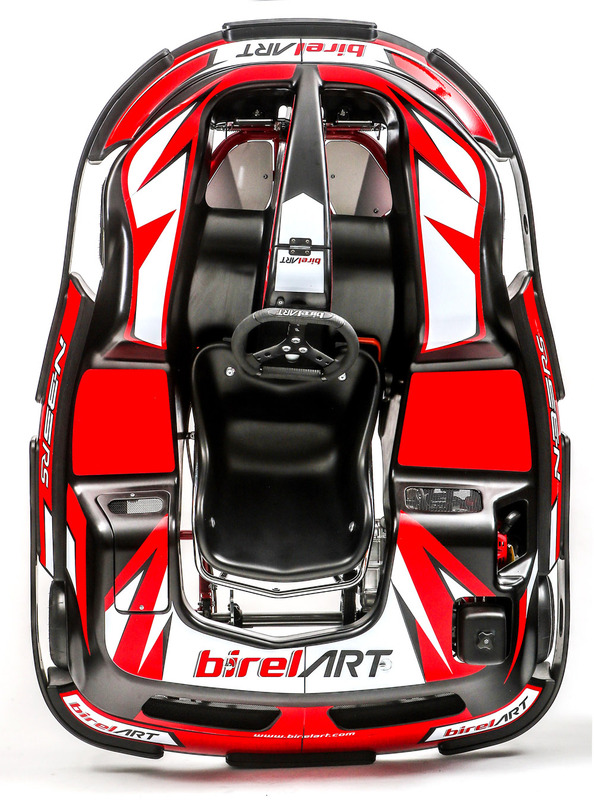 Designed to evoke the lines of a competition kart, it presents an appealing design and represents an elegant and futuristic artwork, in terms of its graphics and accessories. 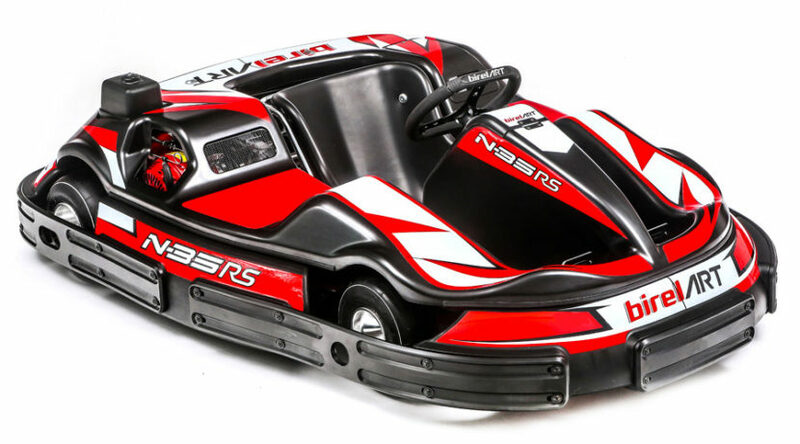 It is fitted with a complete covered bodywork, featuring a rapid fixing system: it is made up of five quick-fit screws and a quick release steering wheel for easy removal. 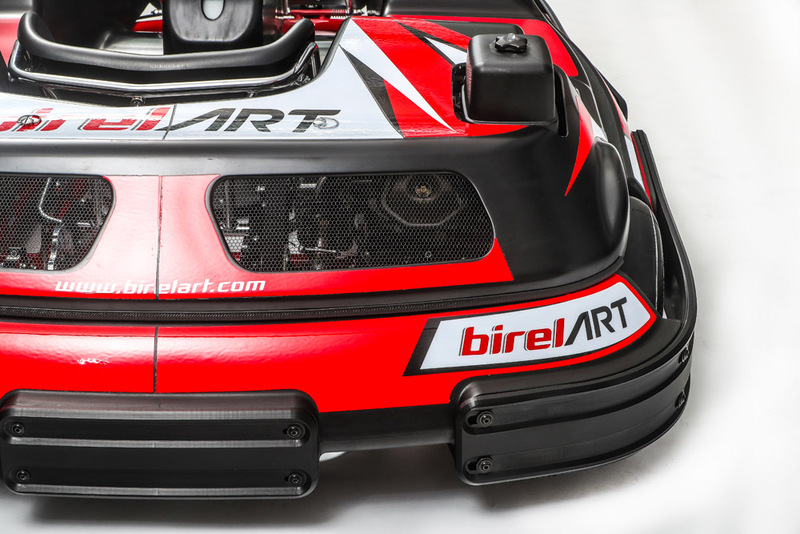 The cover has been designed to enclose the entire front and rear of the chassis, creating a survival cell around the driver and increasing the safety. 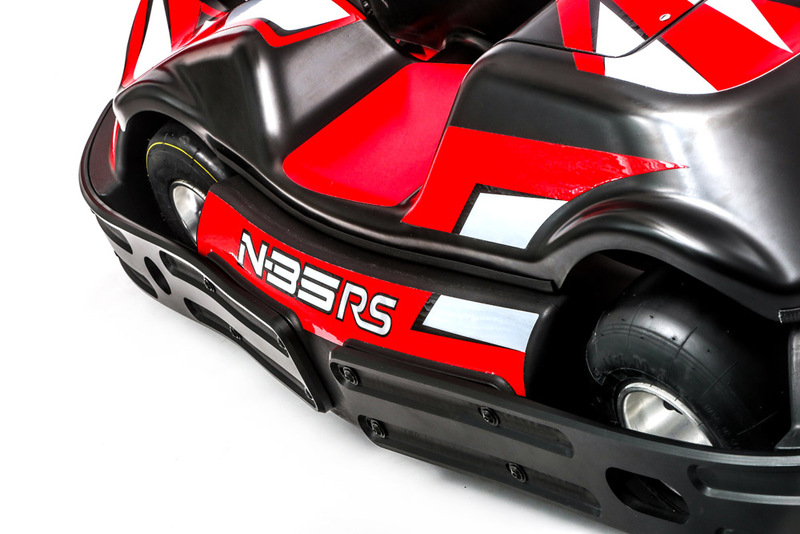 In order to limit damage to the kart’s wheels and mechanical parts, fenders are attached to the chassis by means of rubber inserts to isolate them from the chassis structure. 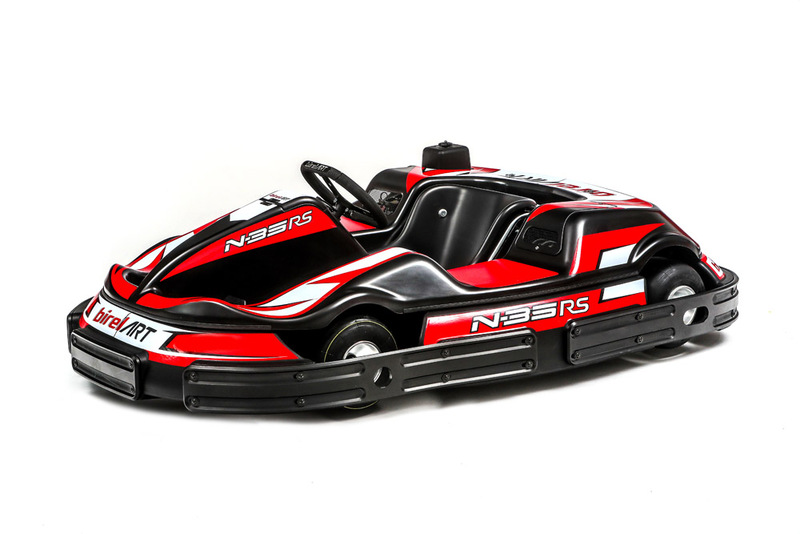 In addition, the bodywork is made from memory system plastic, designed specifically to withstand and absorb impacts of over 10G. 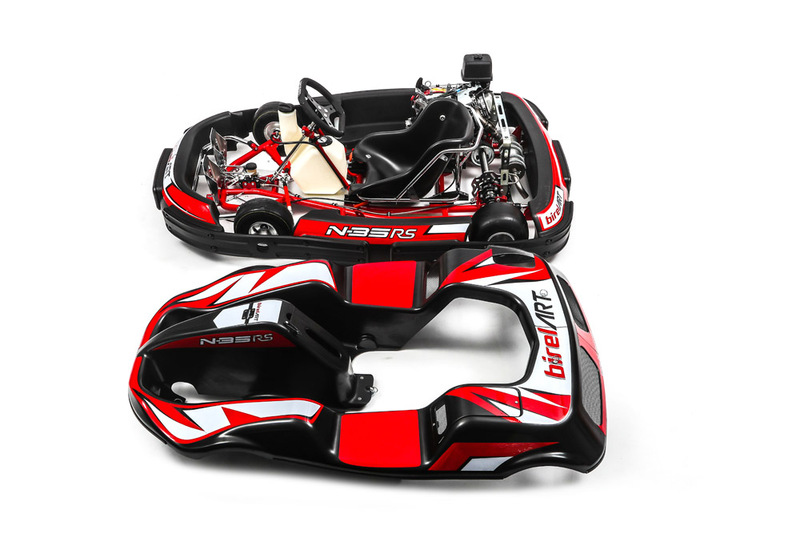 The chassis is made from Ø 35×2 mm chrome molybdenum, with additional strengthening at key points and its design is derived from experience gained in racing. 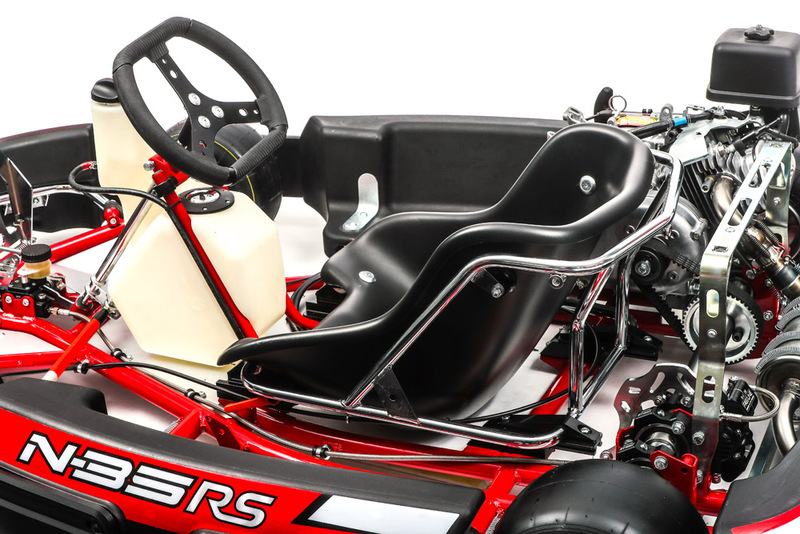 A very new element in the Rental Market is represented by the removable steering wheel: it has been studied in order to allow an easier removal of the complete covered bodywork, thanks to the removable steering wheel hub, as used in single-seater race cars. 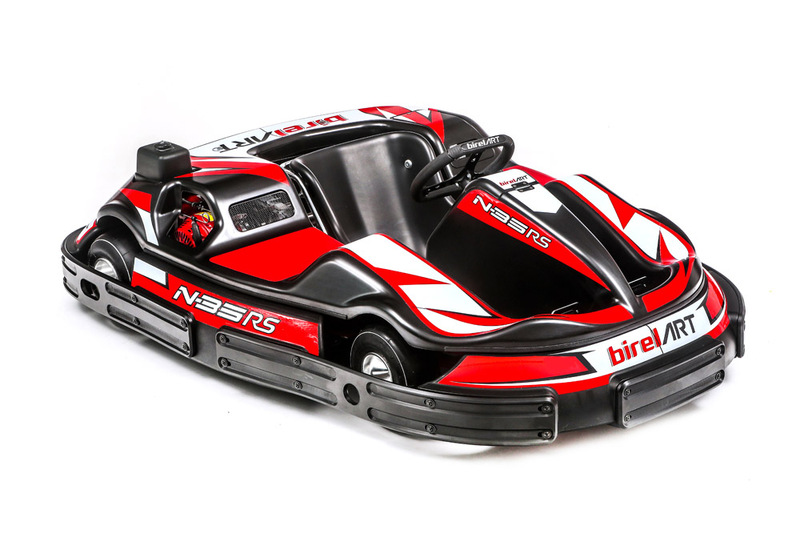 The steering is composed of spindles with cast stainless steel body, with a pressed lever and a removable wheel axle by means of a fixing bolt. 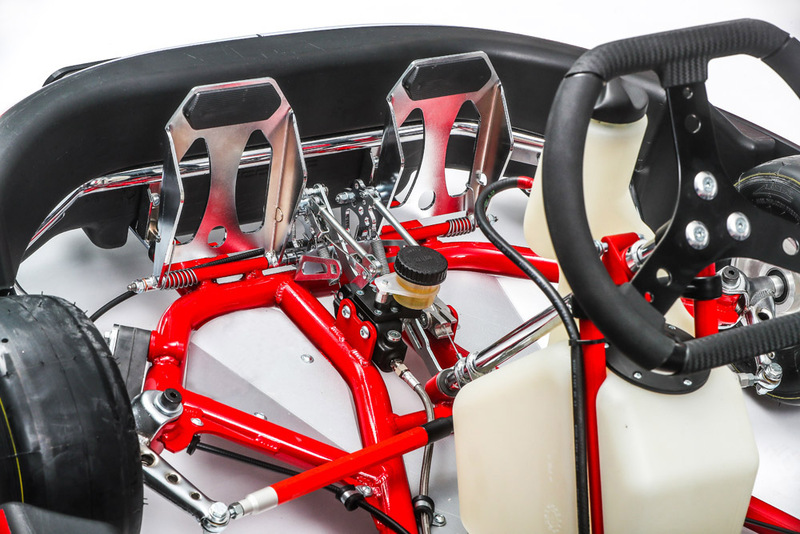 Steering tie rods are made of special plastic material with aluminum bushes to fix uniball. Each front wheel is mounted on four bearings to reduce axle loads as much as possible. 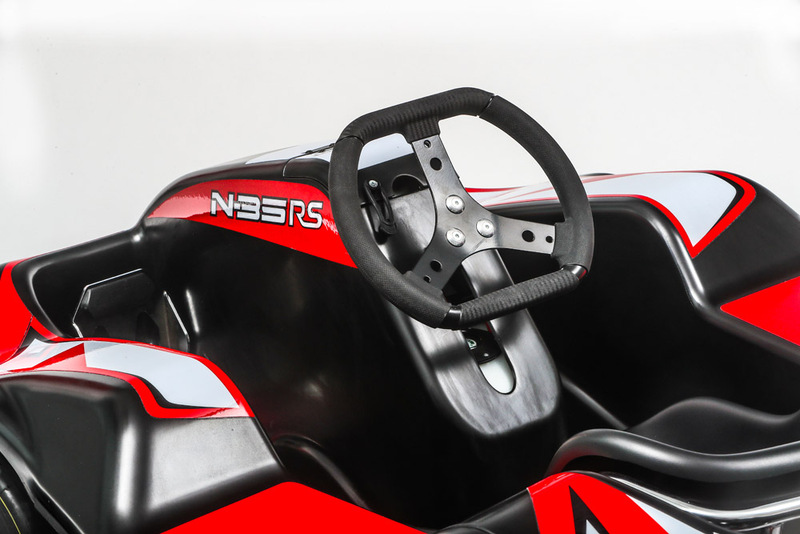 There is an angled steering wheel support in pressed aluminum. 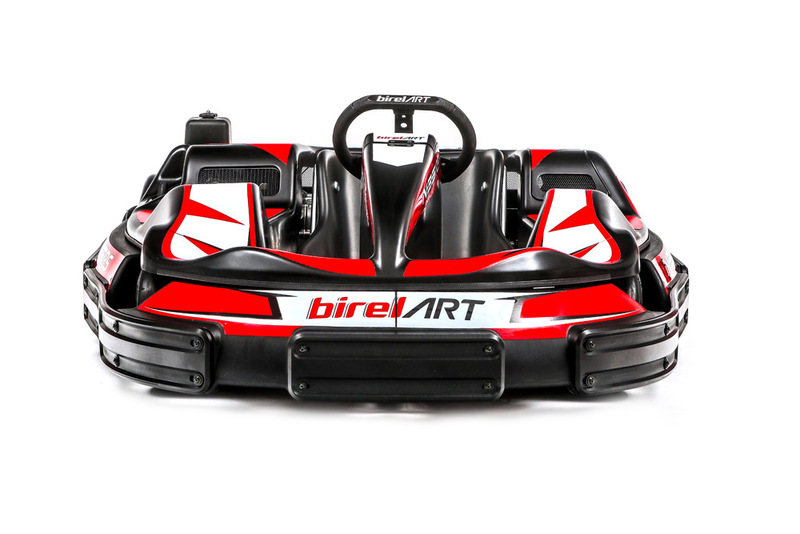 The kart has a 12-litre tank with automotive type bayonet fitting, accessible via a flap on the top surface of the bodywork. 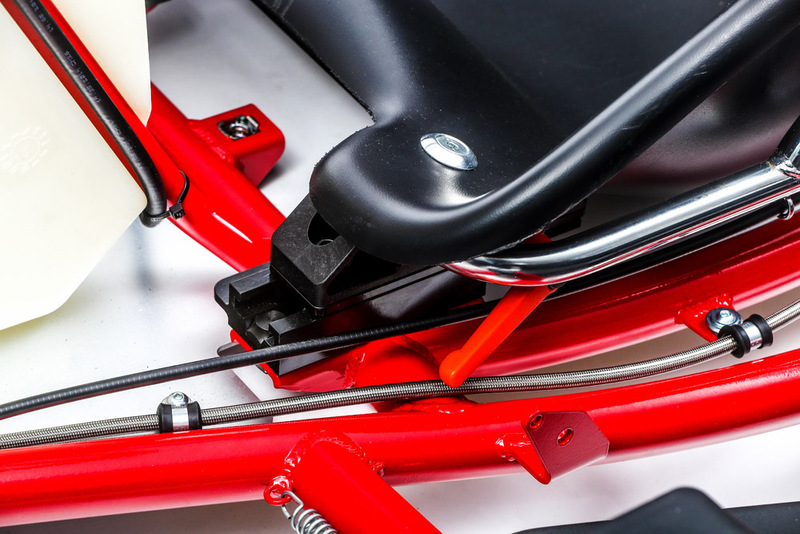 The seat is mounted to a steel frame on runners that allow a movement range of 80mm: the adjuster handle is conveniently situated on the left side of the seat. 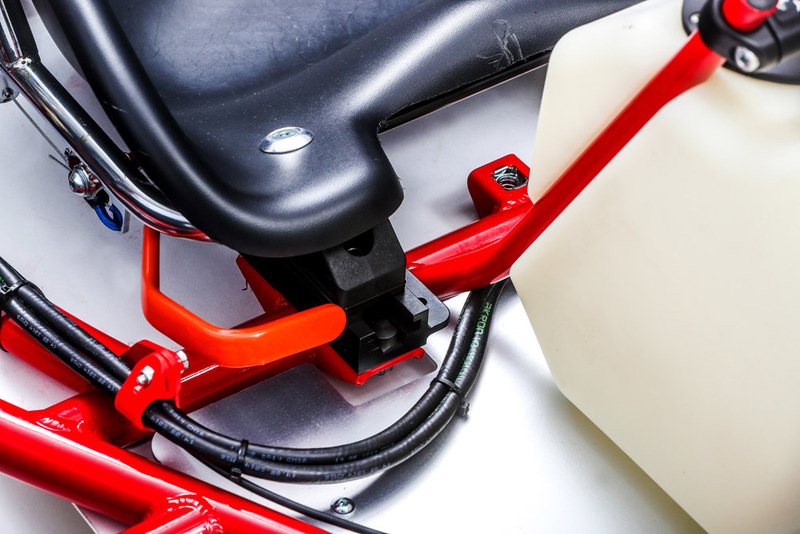 The pedal box can be adjustable manually or by means of a cable from a lever and it is situated on the right side of the seat, which can be operated by the driver. It has a movement range of 30 mm. 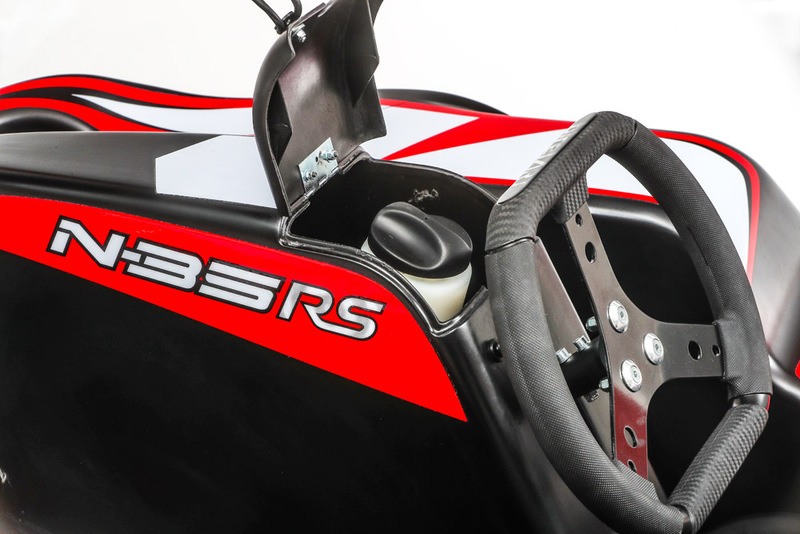 A new SDBS (Slowing Down Brake System), which comes into action during braking, reduces the speed of the vehicle by operating on the throttle return cable. 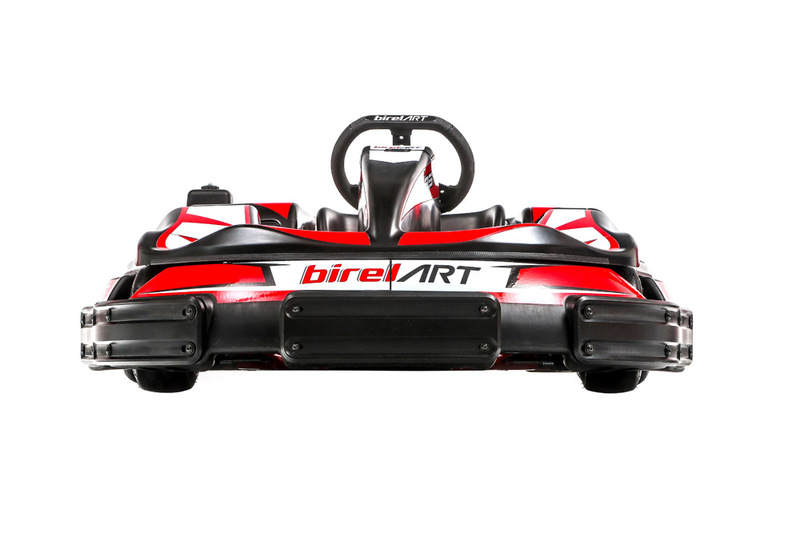 The brake system is composed of a Ø 22 mm master cylinder with separate fluid reservoir above the cylinder. A caliper with two Ø 38 mm pistons with road-car derived pads permits a longer life of the system: it works on stainless steel runners to reduce friction and increase mileage. Nylon brake lines are manufactured to aeronautical standards: they are covered in stainless steel weave to withstand over 1000 bar pressure. Steel Ø 180 mm x 8 mm Wave disc, fitted to a fully machined aluminum caliper. The Axle is made of molybdenum chrome steel with Ø 40 mm x 5 mm thickness, mounted on four bearings. Rear hubs are made from fully machined aluminium with Ø 40 mm x 100 mm length, which are fixed with an 8 mm key that blocks the hub. 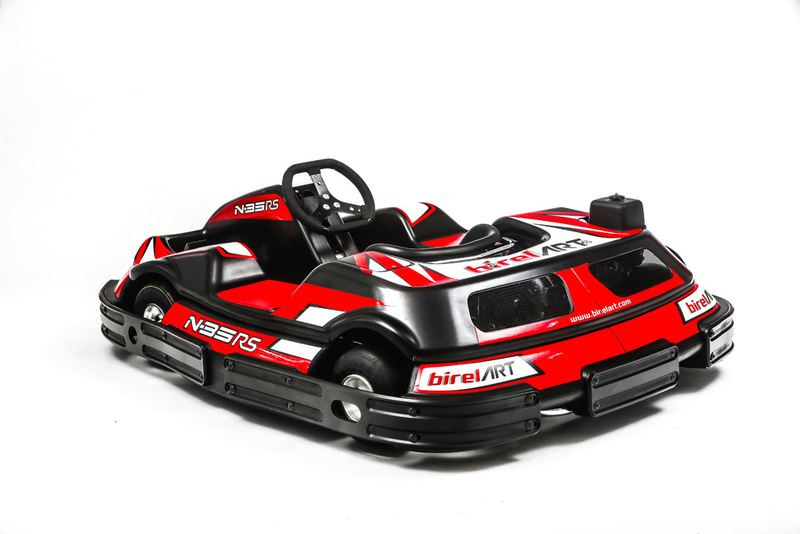 The karts can also be fitted with exhaust silencers tailor-made for the Honda GX 200-270-390. 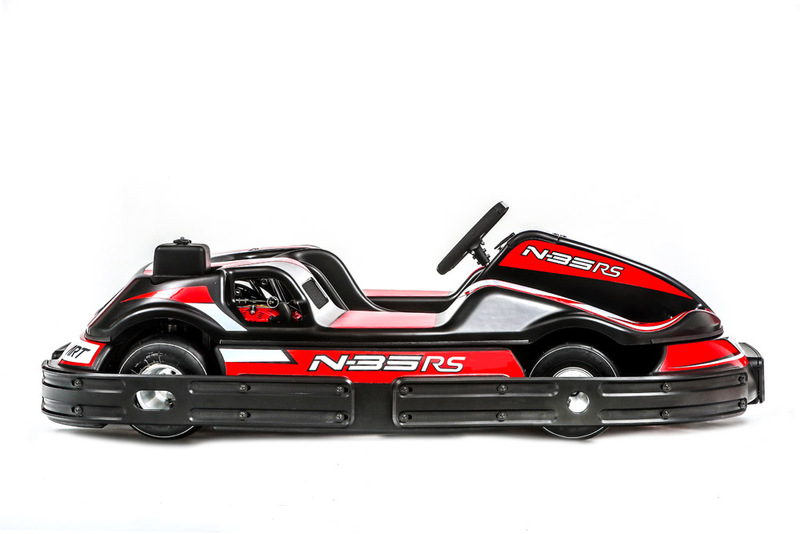 They are designed to increase performance and reduce both CO2 emissions and noise.